We’ve been really busy ever since I got here. Maybe one of the biggest changes is the name of this place. They are now Las Tejedoras Manuales de Léon. Short and to the point. For three years people have been asking me why they didn’t change their name. In August we had a couple of groups from the UN here, and they both suggested the change for advertising purposes. So now it is done. We even have a new sign. Cecilio over painted the old one with a couple of coats of white, then the new name in Spanish, and under that, in English, The Handweavers of Léon. I wouldn’t call it a professional job but it's pretty nice and does the trick. The English part of the sign is a concession to those Americans who would say they couldn’t tell if there was a weaving studio there until they got out of their car and looked in the door. Boy, was I ever glad Cecilio was here when I came. 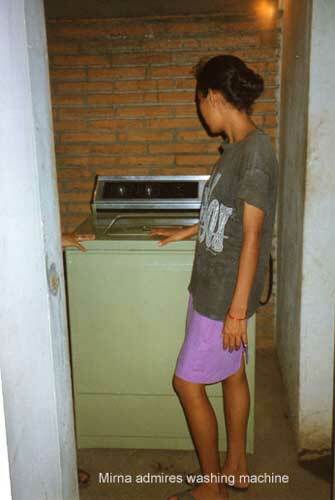 The Sister City Project had sent down a washing machine I had asked for last year. It’s a dandy, too, an avocado green Whirlpool. It was put in the yarn room when it came, while the women all wondered what it was for. Yes, they knew it was a lavadora, but why here? My idea was to use it when they dye yarns. It could save them a lot of work and do a better job, using the spin cycle to remove the excess dye water. I had thought they could fill it with a hose, then after the yarn soaked a while, just spin out the water with the drain hose dropped in the bottom of the old, unused shower. But I hadn’t known what was behind the stuff that had been stored there. When the UN built the building, they provided two toilet stalls, a shower, and two wash basins for the women and another set-up for the men. When the Salvadorans left in 1988, they took all the equipment they could get loose, including the light fixtures and the wiring as well as the wash basins with the plumbing. They said they had as much right to it as the Nicaraguans did. Well, first we had to get the washer in the bano. When Cecilio took out the door and its frame, we had 1/4 inch clearance, so it got in, but just barely and scraping the sides. Then Cecilio decided to see if the drains worked, so we tested them with a hose – everything functioned after all these years. 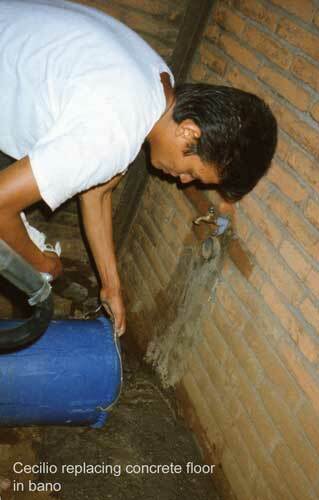 The pipes had been cut off flush with the wall, so Cecilio had to chip away concrete to get to the water pipes. He cleaned the pipes – after ten years there was a lot of stuff in them, including inch-long baby lizards and lizard eggs ready to hatch. They were the first lizard eggs I have ever seen. We got a couple of faucets and Cecilio installed them and attached the washer. After telling them it always had to be set at “cold – cold” because that’s the only kind of water they have here, we got started. The women gathered around, all excited, the weavers and the neighbor women. They were disappointed when I told them it was only to be used for dyeing. They wanted to know if this was the kind of machine I used in the States, this wonderful marvel. I have to insist the washer be used only for dyeing because when it wears out, they’ll have to buy the next one themselves and it needs to last. The women said they’d like to be able to use the shower at times, too, so I sent Cecilio for a new shower head. By the time he got back from the hardware store , there was water all over the floor, pouring in under the bricks of the outside wall. They turned off the water, Cecilio dug to the connection he had just put into the main line. That was okay. The water was coming from under the floor. Cecilio started chipping out the concrete floor above the pipe line looking for the leak. He broke out concrete for the whole 8-foot length before we saw that the leak was gushing from under the shower. I suggested cutting the pipe there and running a new pipe up the outside wall of the shower with a shut-off valve half-way up, so that’s what he did. So they now have a working shower complete with soap dish and shower curtain. They use it on exceptionally muggy days. Cecilio went to town and bought a sack of cement that he brought back on the bus, then carried on his shoulder the block from the bus stop to the co-op. I can’t remember ever seeing anyone carrying a sack of cement that far, not even in the good old days when I was young. He was there early the next morning with trowel and float and re-concreted the floor. I hadn’t expected that. It’s rained almost every day since I’ve been here. The days start out dry and sunny but usually have rain hard and fast in the afternoon. Most days it’s over quickly but today it has been raining for hours on end, often hard, an it’s been cool. I had to put another shirt on, I was so cold, to the delight of the weavers. We’ve done a lot of dyeing since we got the washer. We usually dye the cotton in six pound batches; that’s a quantity they can handle easily and is enough for several throws. That brings up another thing: we had rigged up a miserable contraption a couple of years ago to wind skeins on. I wanted a change, so I rummaged in the pile of junk in the back corner and found a pipe with a crank handle. Then I drew a picture of what I wanted: a US colonial-style drum yarn winder. Soon Cecilio was assembling the pieces and it worked like a dream. It worked so easily, he concocted a couple of thread stands to use with it, and now they crank out skeins for dyeing two at a time, a mile a minute. It’s great. I’m hoping to leave them with the ability to do this hard work they do in a somewhat easier fashion. I think this year we have accomplished a lot already. The kids in the families are getting older. 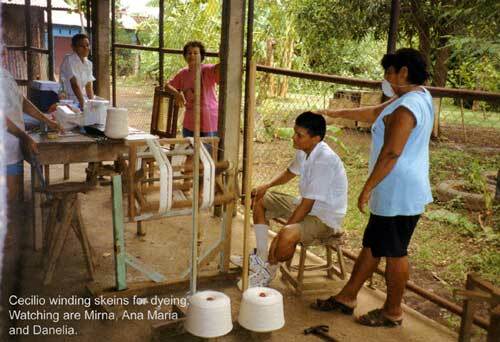 Ana Maria’s Marvin goes to university in Managua. He’s studying civil engineering. He comes home on weekends for Ana Maria to do his laundry. He studies constantly while he’s home, repeating things aloud over and over to memorize them. Last weekend he came home with a big puppy (about three months old). He’d carried it in his arms all the way on the bus. Can you picture being allowed to do that on a bus here? All his dogs get named Rocky Balboa, with a secondary name of Sylvester Stallone. Mirian’s son Hector is studying “computación”. He showed me his books; he’s learning WordPerfect 6 right now. He gets to actually work at the computer two hours a day, he says. He also has studied Excell, Lotus 123, Windows 97 and such. His older sister Norma was trying to study nursing last year, but there was a lengthy student strike at the university, then this year there was a 4-month doctors’ strike. She started studying computers, too, but Mirian couldn’t afford to keep two kids in school. A couple of days after I got here, Norma left for Costa Rica to work as a domestic to make enough money to start school again in January. The tuition is $!2 a month. Norma called her mom the day after she got to Costa Rica. She said it was beautiful and she liked it. The following Sunday she called again, this time crying all the time because she missed her family so much. There’s a new phone in the neighborhood, about a half block up a little roadway from the co-op. It’s a portable phone, so if one of the weavers gets a call, the lady with the phone brings it down. There are now five phones in the neighborhood. I asked. Mirna, the now 18-year-old weaver who has been here since before I came two years ago, is not attending school this year. Last year she worked five days a week and went to school from 7 a.m. to 2:30 p.m. On Saturdays. She’s in her second year of “secondaria” but she can’t afford to go to school this year. The tuition for her Saturday classes is $5 a month. Mirna has to work to help support her family – she’s the main breadwinner. Mirna is a dependable girl, here early every day, and is by far the most productive weaver in the coop. She works hard and maintains a happy disposition all day. I find her a remarkable person and hold her in highest regard. She’s already earned the right to a good life – I hope she gets it. She’s a gem. Danelia has a teen-aged girl staying with her to go to school: Lucia. Her family lives out in the campos and she has eight brothers and sisters so Lucia has to make her own way. In order to go to school, she came to Léon to stay with relatives, but the family didn’t like the burden of the extra mouth to feed, so Danelia took her in. She’s here at the co-op every day at 7 a.m. She washes her white blouse and navy blue skirt and hangs them up to dry, then she works until almost noon when she irons her school outfit and then goes to school. She’s an uncommonly pretty girl, sweet, well-mannered and hard-working. She not only works as a bobinera but also weaves. I’ve been trying to figure out what the difference is between the way we teach weaving in the US and here. Here, it’s a job, no theory of weaving, no principles of how the loom functions. Someone comes to this studio new and they are put right to work tying on warps, filling bobbins, whatever. “This is how it is done,” they are told, and they do it. Darned well, too, from the beginning. No glamour attached.